The Singapore Heritage Society thanks Tote Board and Singapore Turf Club for their generous support. 15min: Photo of each participant with their art work. Min. 20 pax; priority to SHS members + guests. 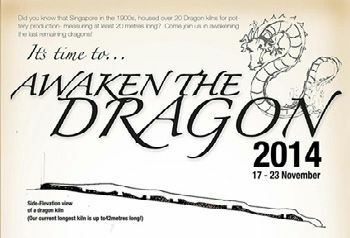 Awaken the Dragon is a community art project surrounding Singapore’s last two Dragon Kilns. The project aims to invite 3,000 members of the public to participate in making a collective sculpture from clay and fired in the Dragon Kiln. This is a unique opportunity for the public to use and experience an important part of our heritage. 1. Educate the community about Singapore’s history and heritage in ceramics by sharing the story of the dragon kilns, as well as the basics of ceramics making. 2. Explore the arts, as each individual will be given clay to create their own art work that will represent them in the sea of other art works. 3. 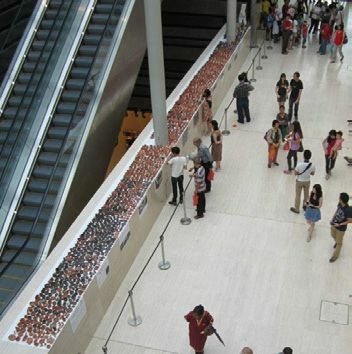 Engage the community as they learn to make their own pots that will be placed together with all the art work of the other 3,000 participants, inside the dragon kiln for the biggest ceramic firing in Singapore, in November. Awaken the Dragon is produced by Michelle Lim and Post-Museum. It is an independent effort that is endorsed by National Arts Council and National Heritage Board.